The son of a founding member (and first president) of the Society of British Artists, Thomas Heaphy junior based this watercolour on William Westall's painting 'Entrance of Port Lincoln taken from behind Memory Cove, February 1802' (1809-12), now in the British Ministry of Defence art collection, London (see Elisabeth Findlay 'Arcadian quest: William Westall's Australian sketches', Canberra, National Library of Australia, 1998, pg. 22), or the engraving after it by John Pye, published in London in 1814. There is no known connection between Westall and Heaphy junior, or with Pye, but it was common practice for artists then (as now), to copy or adapt the work of other artists. William Westall (1781-1850) travelled with Matthew Flinders on his 1801-03 voyage to circumnavigate Australia as the expedition artist, and his resulting drawings and paintings are among the most important of early nineteenth century Australia (a substantial number are in the National Library, Canberra). His painting 'Entrance of Port Lincoln' was in fact a composite of two separate drawings he made of the subject. The engravings by Pye after Westall were published as 'Voyage to Terra Australis' in 1814. 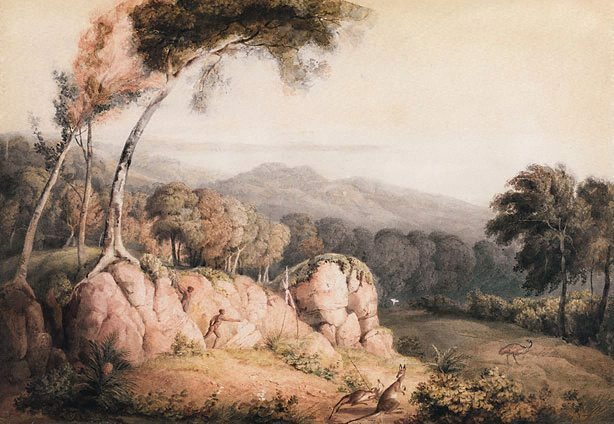 The title of this watercolour is based on an inscription on an old backing sheet 'Fancy view of S Australia by Thomas Heaphy the younger' and its title at auction in 1968. Signed and dated l.r. corner, brown watercolour "Tho Heaphy/ 1836". Hendrik Kolenberg, 19th century Australian watercolours, drawing and pastels from the Gallery's collection , 'Introduction', pg. 6-16, Sydney, 2005, 9, 26, 27 (colour illus. ).